Professor Jennifer Hunter thought in high school that she wanted to be a doctor. She remembers being told, however, that “girls don’t do hard science.” While at the University of Waterloo in Ontario, Canada, she started with a major in biology. She almost failed those courses but excelled in physics, and so she switched to a physics major. “It was the best thing I ever did,” she recalls. Now, Hunter is an associate professor of ophthalmology, with cross appointments at the Center for Visual Science, the Department of Biomedical Engineering, and the Institute of Optics at the University of Rochester. 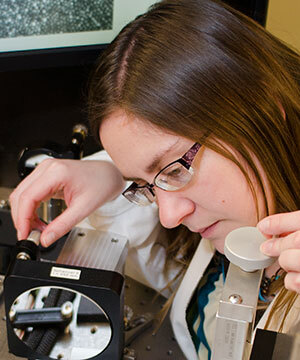 Hunter became interested in optics—imaging and microscopy in particular—during her sophomore year of college She completed her master’s and PhD at the University of Waterloo. The latter degree was multidisciplinary, an unusual combination of physics and vision science. Afterward, she came to the University of Rochester for her post-doc in retinal imaging—and has been here since. Hunter enjoys the freedom, flexibility, and variability of her day in academia. She is always in pursuit of the next new question that arises during the research process. In addition, she finds the sense of achievement when something actually works to be particularly gratifying. Meanwhile, as an advisor, her role is to help guide her graduate students to become scientists in their own right. Other perks include the multidisciplinary nature of her work and having colleagues worldwide. As a scientist and a parent, Hunter sees colleagues of all genders working to balance family life and home life. In this way, she does not feel disadvantaged as a woman working in academia. She has also become used to being in a predominantly male environment, especially after being a physics major with few other women and now working in optics and imaging. Fortunately, she has found a lot of support in the ophthalmology department and from her post-doc advisor. That said, she concedes that some people do perceive a woman’s ability as lesser. Her advice for fighting this perception is to have good mentors and a strong sponsor who will promote you and invite you to speak at conferences and participate in career-building events. Hunter likes to bike and walk along the Erie Canal and play with her son and dog when she’s not at work. She loves to bake desserts, especially cakes, and she and her husband enjoy going to musical theatre shows. She also enjoys traveling, which happens to be “one of the perks of this job!” Her two-year-old son has already been with her to Japan and Hawaii, and he will be accompanying her to Ireland soon for another conference. Mainly, she says her favorite thing outside of work is family time.